"There's still some pomp and ceremony around English grass … It's one of last vestiges of seasonal English produce." Wild garlic, another highlight, is sadly coming to an end. 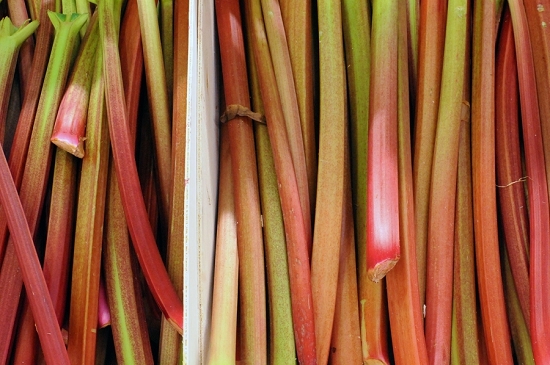 English roots are plentiful, but salads of all kinds are around two weeks late, creating a worrying and rare gap between the Spanish and English seasons, which will run until the latter half of May. Leading salad grower G'S, for example, are filling the gap with imports of iceberg and romaine lettuce from the USA during the middle of the month. 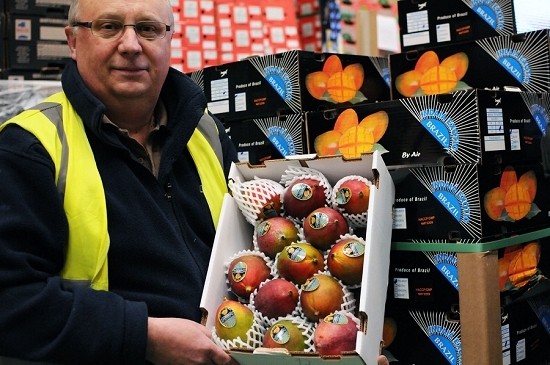 "We’re a bit behind on everything," confirms Geoff Lamb on R Tealing, a fruit specialist. British strawberries are a case in point. "There's a few about but no volumes at the moment. Spanish are a lot cheaper." 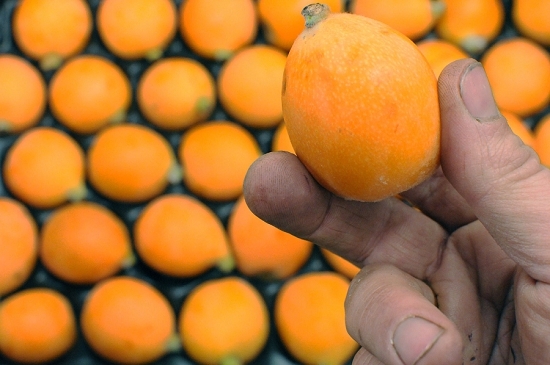 On his stand, I spot a rare sight – the níspero, a.k.a the loquat, from Granada, Spain. This delicious fruit was hiding among Spanish blueberries, South African raspberries, Mexican blackberries and Dutch redcurrants. Other fruit of note on the Market include cherries from Spain. Grapes are moving from South Africa (who are sending decent satsumas at the mo) to typically Chile, India or Israel. European stone fruit such as peaches and nectarines are imminent. 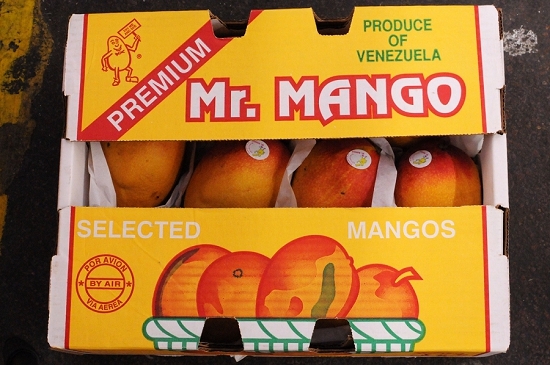 Mangoes are on cracking form, with supplies from countries including Venezuela, the Dominican Republic and the area around Mumbai in India – home of the legendary Alphonso mango. Happily, I bumped into Charlie Hicks for the first time – a veteran grocer who now works with The French Garden supplying the west of England. "Ziggy Stardust was still in short trousers when I came onto this Market," he chuckles. His company are proud of their supplies of air-freighted Brazilian mangoes: "The longer they spend on the tree and in the sun the better." When choosing mangoes, he advises, always be guided by their aroma. Some product is gas-ripened, too, so ask before you buy. 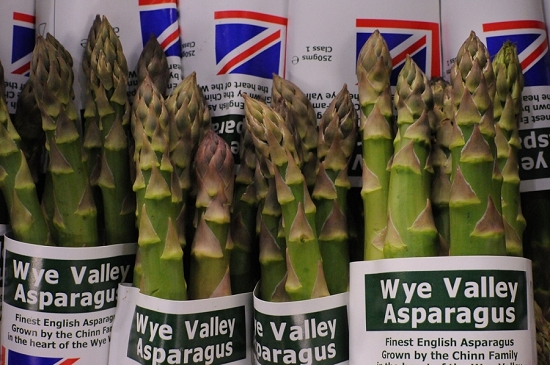 As for the asparagus, two main areas of production are represented at Covent Garden– Norfolk and the Wye Valley. 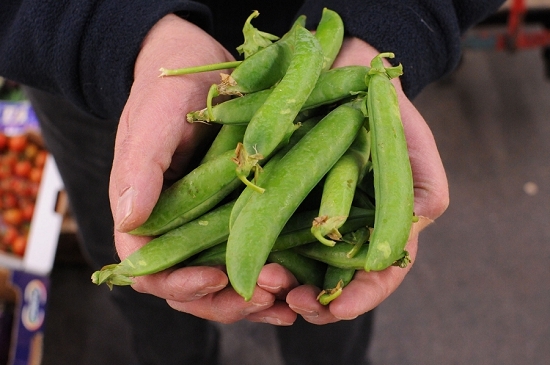 Early crops have been grown under cover, with the maincrop arriving early this month. Growers based near the East Coast have suffered recently due to their exposure to freezing winds and frosts. 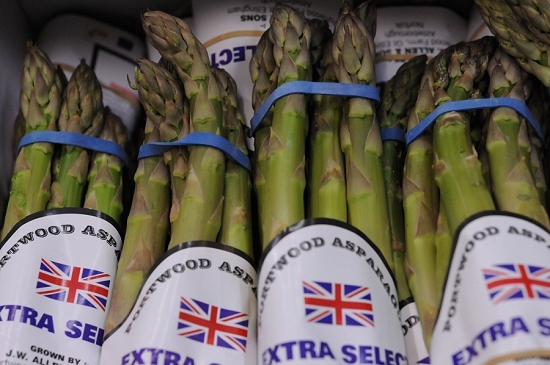 "With asparagus it's all about keeping heat in the ground," explains Simon Collier-Ward on Side Salads. 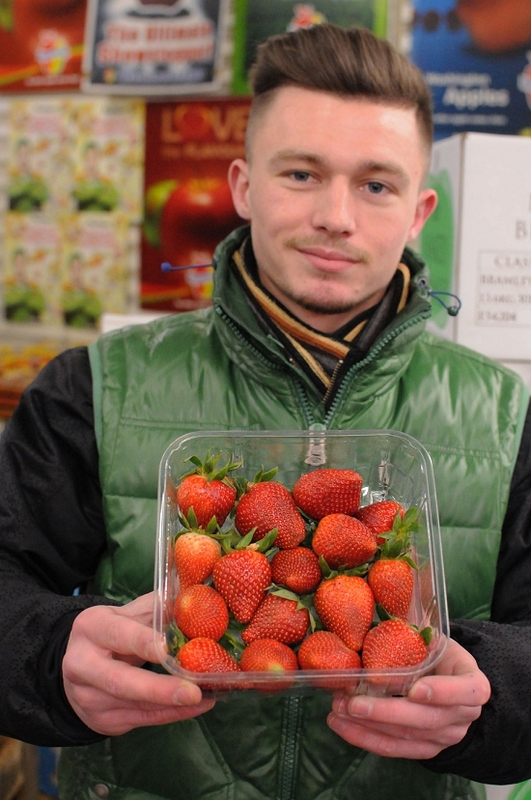 One of his growers, he says, lost around £100,000 due to a two-week delay on getting crop to Market. 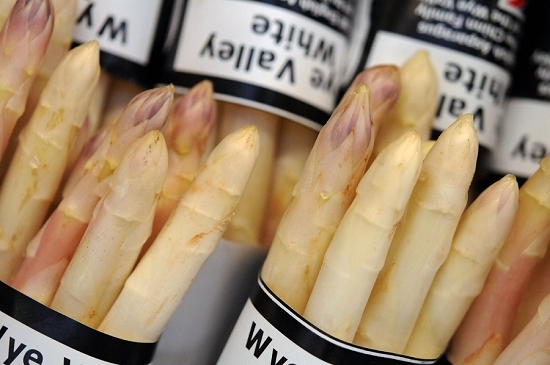 On a brighter note, you'll also find purple and white asparagus – the latter a first here, grown by the Chinns. "We're very excited," says Charlie. 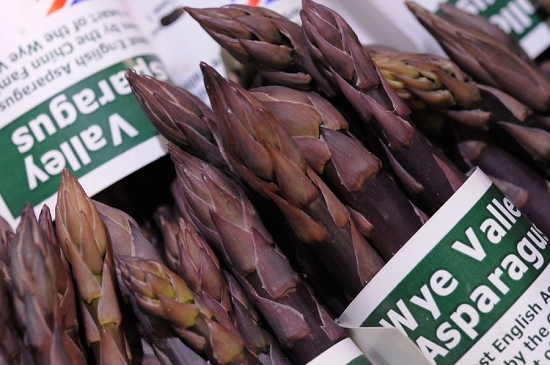 "It’s interesting on a plate to have green, white and purple asparagus together." Wet garlic is another of his favourites, with supplies over from Egypt. For other British highlights, you'll find purple sprouting, the first cauliflowers, rhubarb, watercress and Jersey Royals. Early peas and broad beans are also over from Italy, and Continental tomatoes of all shapes and sizes are now getting into their stride.